With the opening of an Eames exhibition ‘The World of Charles and Ray Eames’at the Barbican, ani M INTERIORS profiles these Modernist masters. 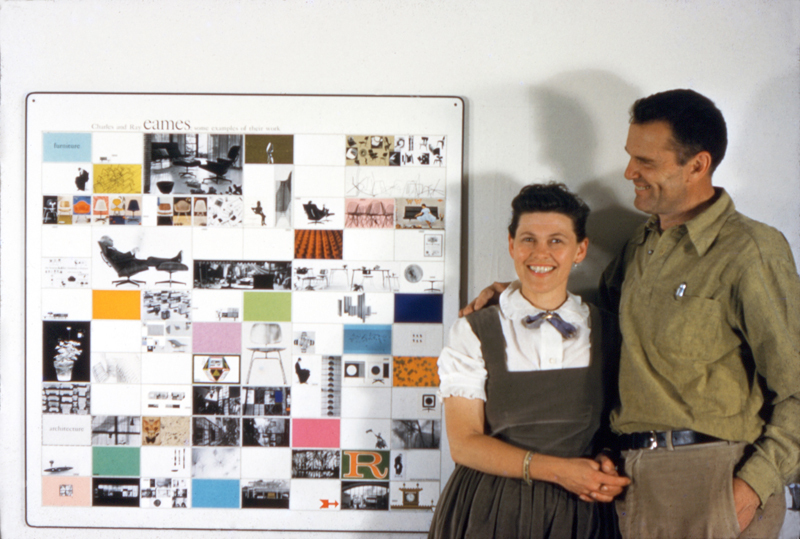 American husband and wife team, Charles and Ray Eames, set the world alight with their designs for modern living. Drawing inspiration from nature and society around them and experimenting with materials, the couple were prolific in their production of furniture, architecture, fine art, graphic design, fabric, film, technology and even produced splints for medical use. 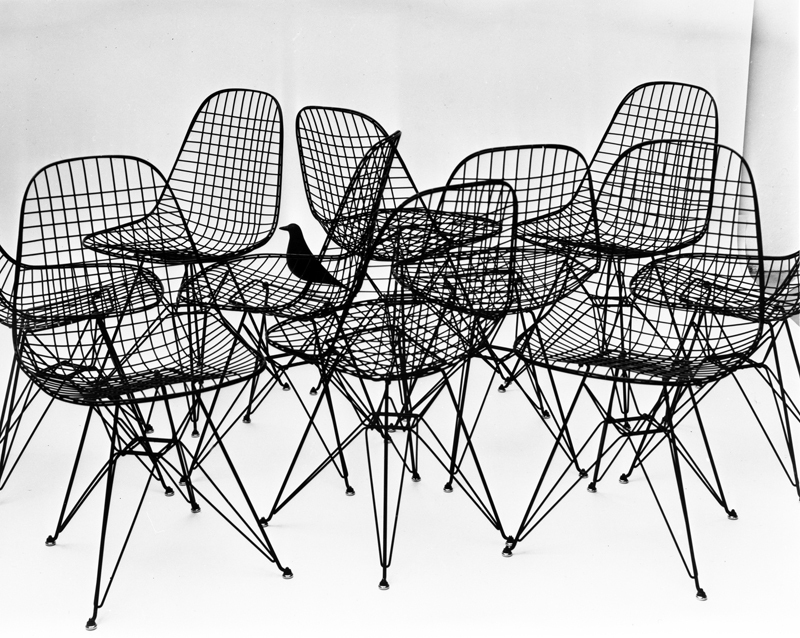 Photo Credit: The World of Charles and Ray Eames. 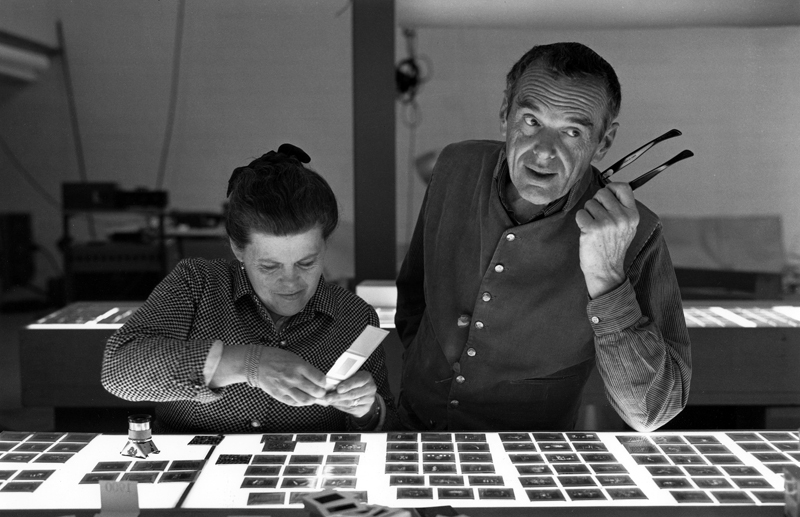 Charles and Ray Eames selecting slides. © Eames Office LLC. Design movements are often a reaction against what has gone before. For example, the fluid, natural, ornate symmetry of Art Nouveau gave way to the straight lines, primary shapes and stark simplicity of Modernism. It isn’t that simple though. Modernism was borne out of a world staggering back to its feet after war. Leading thinkers such as Darwin, Freud, Einstein and Marx were challenging religion and the status quo. Increasing industrialisation had a profound effect too; as people migrated to the cities their homes and working lives would never be the same. Artists and designers rushed to interpret and capture the spirit of the age. As a consequence, Modernism is characterised by its hard lines, industrial materials and paired back-to-basics designs. It has an austerity that challenges traditional notions of beauty. This Modernist design duo however, were different. Their love of comfort and joy at the natural world suffused their creations. They softened Modernism’s Brutalist tendencies and created designs for living. 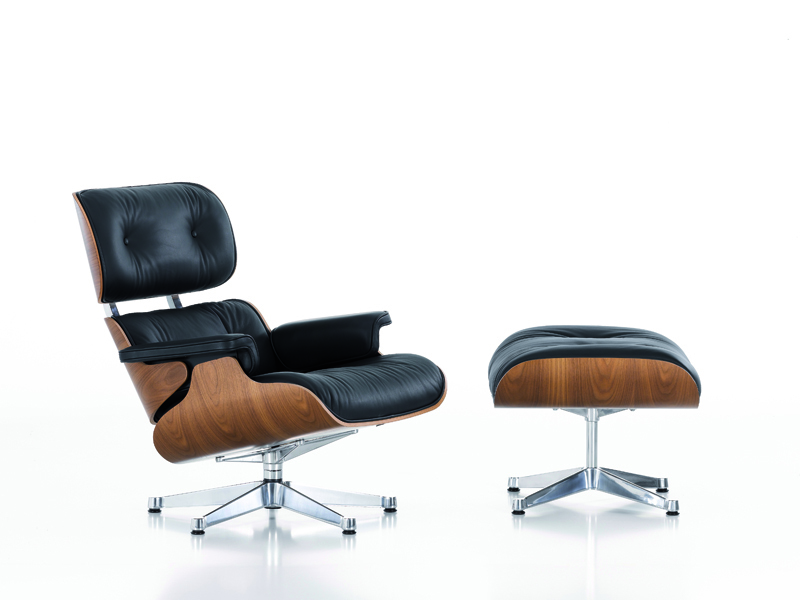 Take the iconic Eames lounge chair with ottoman (670/671) for example. It presented itself to ‘50s America as the ultimate symbol of style and comfort with the “warm receptive look of a well-used first baseman’s mitt.” Well-worn, softened leather over a feather filling were not the usual Modernist materials, but then Ray and Charles were not the usual Modernists. The pair perfected the bold use of molded wood and plywood for furniture and as they were receiving awards and accolades for doing so, they had already moved on to pioneering the use of new materials such as fiberglass and plastic resin. They created chairs and tables, shelves and screens, everything from houses to children’s toys. And in everything they did, they brought a sense of fun. 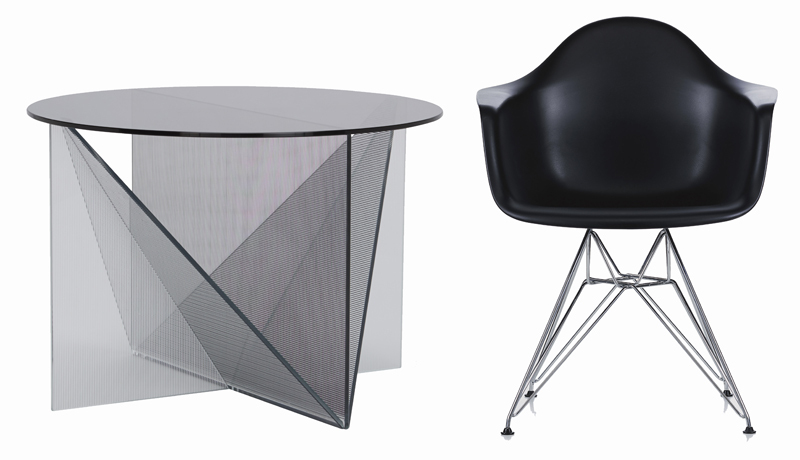 Eames’ designs are meant to delight. And almost 50 years later, their designs still bring delight. 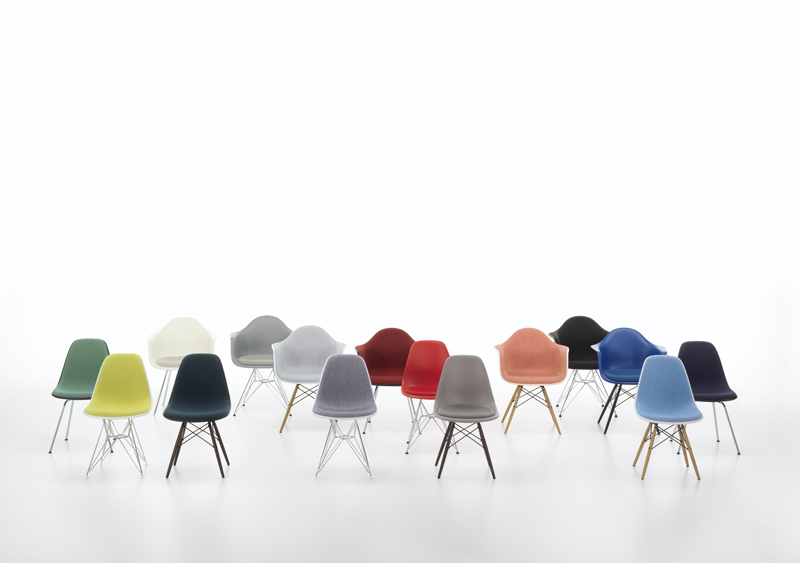 Revel in The World of Charles and Ray Eames until February at the Barbican. The ani M INTERIORS design team is happy to create an Eames-inspired scheme or build a scheme around your Eames centerpiece. Get in touch today to find out how to make your interior world class.